The Royal Sonesta Houston is a 4 diamond hotel offering 485 newly renovated well-appointed guest rooms. 24-hour fitness center- complimentary shuttle within 3 mile radius- complimentary HSIA- roof top swimming pool- business center- restaurant- lounge and fifty thousand square feet of meeting space. 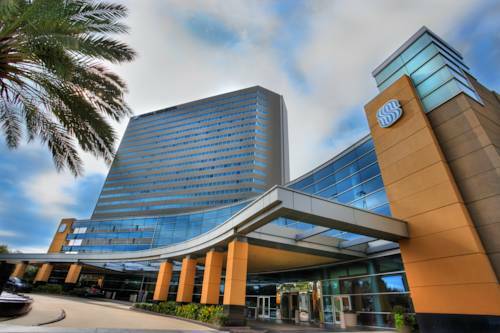 The hotel is located in Uptown Galleria Houston - minutes from downtown- shopping- and local attractions. The sleek new bar and lounge offers a relaxing place to unwind while enjoying a small plate menu and specialty drink from the Liquid Art menu. Offers a wonderful ambiance to enjoy the international cuisine. ARA is open for breakfast / lunch and dinner. A one stop shop offering everything needed to start your day or cool down for the evening featuring PJs coffee - healthy chef inspired bites and curated notions.